Moscow, February 5, Interfax - Leader of the self-proclaimed Kiev Patriarchate Filaret Denisenko awarded American Republican senator John McCain with the order of St.Vladimir of the 1st degree. 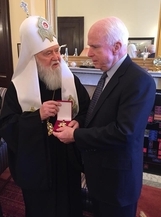 He handed over the award to McCain in Washington "for his active position on supporting Ukraine during events at the Euromaidan and Russian occupation of Crimea and Donbass," press service of "the Kiev Patriarchate" reports. "The patriarch reminded Senator McCain about the United States of America's duty to help Ukraine in protecting its independence," the report reads. Denisenko arrived in the USA capital to participate in the Prayer Breakfast organized by President Barak Obama.